Where do bed bugs come from? And how do the bed bugs end up in your home and worse, in your mattress? Find the answers here. As the bed bug epidemic is sweeping the country,this page will help to answer these questions and give advice on how to prevent the bedbugs from entering your home in the first place. BED BUGS or C. lectularius probably originated in the Middle East, in caves that were inhabited by bats and humans. Bed bugs existed in in ancient Greece as early as 400 BC, and were described by Aristotle. Pliny’s Natural History, circa 77 AD in Rome, claimed that bed bugs had medicinal value. Bed bugs were first mentioned in Germany in the 11th century, in France in the 13th century and in England in 1583. WHERE DO BED BUGS COME FROM ? 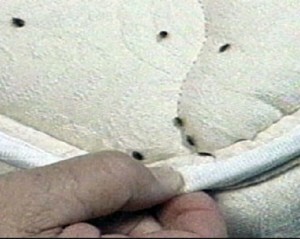 The most common hiding place for bed bugs is the lining of mattresses and beds. Many people's first encounter with bedbugs are bites after sleeping on an infested mattress in an overseas hotel or hostel. The bugs will then sometimes travel home, in the luggage of the victim. In the western world, bed bugs were almost eradicated as pests in the early 1940s. The current wave of bed bug infestations across America is the result of a gradual comeback since 1995. The bed bug is also returning to England, mainland Europe and Australia. The exact causes of this comeback of bed bug numbers remain unclear. More frequent exchange of second-hand furnishings in homes. Greater focus on control of other pests resulting in neglect of bed bug control. Increasing resistance to pesticides among the bed bugs. WHERE DO BED BUGS COME FROM, IN MY HOME ? These days the pesky bed bugs seem to turn up everywhere: Dorm rooms. 5 star hotels, like the Sheraton, Libraries and Abercombie and Fitch stores (as a oft repeated news story showed us recently). But where do the bedbugs come from? The answers are many and since these little bloodsuckers can live for up to 1 year without feeding, you never know exactly where they have been hiding, before they unleash themselves on a sleeping victim. 1) Bugs and eggs that can hitchhike on pets, like cats, dogs or horses. 2) Bed bugs often hide on clothing and in luggage, that have been returned from abroad or that have been open in a hotel, hostel or dorm room. 3) Bed bugs can infest items like furniture or clothing. Second hand furniture and clothes have become popular and may one of the reasons why the bugs are spreading. Furniture that have been brought home after they were found discarded on the street, can also be the route used. 4) The bugs can come from nearby houses or apartments, if there are easy routes like false ceilings and ventilation channels. Pipes and wires, cooling vents or the dead spaces between walls can also be the route that the bugs have come from. 5) The pests can also have come from wild animals like birds or bats. 6) People visiting your house may also unwittingly have brough in an infestation, as the insects can hide on a person’s body, a rucksack or even in a laptop, that can be warm and snug and perfect for bed bugs. 7)Packages sent from abroad is also a common way for these insects to spread to new destinations. 8)Laundry rooms is another place that the bed bugs may have come from. When people have an infestation, they will often launder all bed linens and clothes. The bed bugs can then spread in laundry rooms, if people have not used a tightly closed bag. 9) Schools and college dormitories have been hid by scandals of bedbug infestations recently, so it is very possible that your child have brought the critters back home with them, unknowingly. - After you have established where the bedbugs may have come from, the next step is to get rid of them. Please, search this website for more information on how to get rid of bedbugs effectively. WHERE DO BED BUGS COME FROM: Where did the bed bugs in your home come from? Please share your experiences in the comment section below.